2019 Topps Baseball Silver packs come with special 1984-inspired inserts not available in regular packs. These are bonus packs meant for collectors buying hobby and hobby jumbo boxes of 2019 Topps Series 1, Series 2 and Update Series. The checklist expands with each release, adding new cards to the mix. For each hobby box bought from a participating dealer, collectors receive one of the bonus silver packs. Jumbo hobby boxes are good for two packs. The 1984 theme runs throughout 2019 Topps Baseball (and even into other sports). The cards found in 2019 Topps Baseball Silver Packs are different from the regular inserts in that they’re printed on chromium stock with a patterned design. That gives them a distinct shine. The checklist is a mix of veterans, rookies and retired players. And while some may have appeared in the original 1984 Topps Baseball set, these are entirely new cards with different photos. It’s just the overall design that brings a level of familiarity. Base cards come with six levels of parallels: Blue (/150), Green (/99), Purple (/75), Gold (/50), Red (/5) and Superfractors (1/1). Autographs are also randomly inserted in 2019 Topps Baseball Silver Packs. These, too, have parallels except they’re limited to Orange (/25), Red (/5) and Superfractors (1/1). 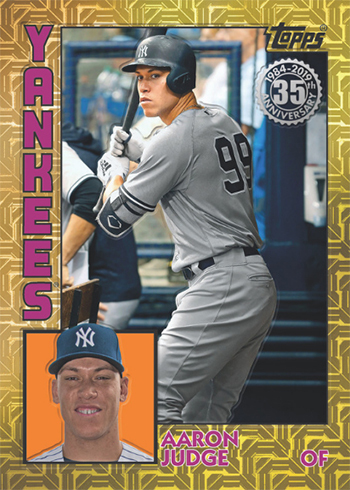 Want to know what cards your favorite team has in the 2019 Topps Baseball Silver Packs? Here’s the checklist broken down by team. Scroll through or click below to go directly to that team. The Diamondbacks have no cards in Series 1 Silver Packs. The White Sox have no cards in Series 1 Silver Packs. The Reds have no cards in Series 1 Silver Packs. The Tigers have no cards in Series 1 Silver Packs. The Marlins have no cards in Series 1 Silver Packs. The Twins have no cards in Series 1 Silver Packs. The Padres have no cards in Series 1 Silver Packs. The Mariners have no cards in Series 1 Silver Packs. The Rangers have no cards in Series 1 Silver Packs. We don’t have any hobby shops in my area so I am always left out of all the silver packs, blue wave, Black Friday, Cyber Monday giveaways. @RJ – Many online dealers also have Silver packs. It’s not necessarily an LCS-exclusive, just anywhere you might buy hobby boxes.